The gumbo at Lady River Eatery on the Mississippi in New Orleans was rich and flavorful, and the boudin sausage, a true Cajun tradition to savor, had a unique texture. 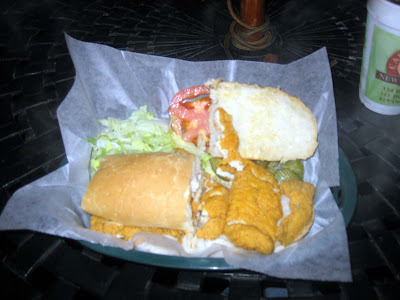 A few days after returning from New Orleans, I must write about what I ate in the Big Easy. It's probably because I'm full of junk food on account of the Christmas holiday: It's good junk but not necessarily good for you. A large part of my motivation for a trip to New Orleans was the food. It's a shame that I didn't get a chance to eat more. I was busy during most of my visit, so I had less time to eat. This is an overview of some of the Cajun and Creole goodness I enjoyed. 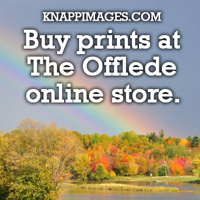 *For a menu, click here. My first full meal came at Lady River Eatery, specializing in "Southern Fare and Spirits," in the The Shops at Jackson Brewery building on the Mississippi River. Gumbo always has been a favorite of mine, so I thought it would be an appropriate first dish for my Crescent City hiatus. 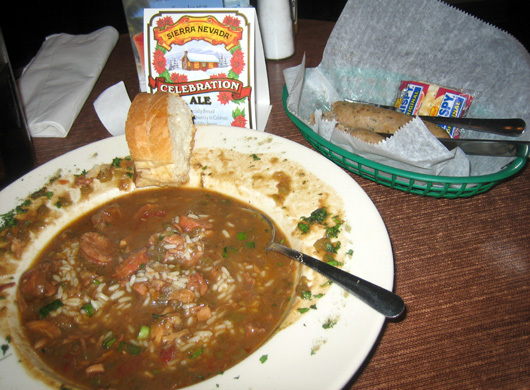 For $5.95, I got a large and beautiful bowl of the sausage and chicken gumbo, above left. The menu says it is "slow cooked with seasonings," and the taste lived up to the description. The herbs had crunch, and the meat was tender. Freshness at its best. The flavors and the color of the gumbo were richer than any canned version I have ever had. That just goes to show that you can never put anything authentically good in a can. Except for Spam, maybe. On the side, I ordered two large links of Cajun boudin blanc (white) sausage, above right, mainly because I've heard my favorite Food Network character, Alton Brown, rave so much about it on his shows, especially "Feasting on Asphalt." This particular boudin (pronounced boo-dan, not boo-deen) included rice and pork. It has a consistency similar to tuna from a can: very flaky. It was served with saltine crackers. Truly a unique Cajun treat. The boudin was also $5.95. New Orleans' French character shows through in its superb cafes. They serve some of the best coffee and French pastries in the United States. 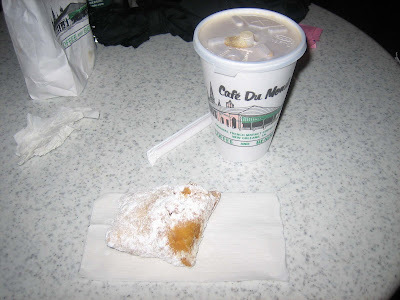 Cafe du Monde is a premier coffeehouse in the French Market, near the Mississippi River. It offers a funky atmosphere. Inside, there is a sizable dining area from which the coffee preparation and beignet-making areas are viewable. Outside, a much larger, covered dining area allows coffee-sipping with the pigeons that come to snap up fallen doughnut crumbs. When I visited, a trumpet player came by and played "Amazing Grace" and a few Christmas classics. Very enjoyable. The most popular items at this tourist trap are the beignets, rectangular French doughnuts smothered in powdered sugar, and a large cafe au lait, a 50-50 mixture of steamed milk and coffee. Search for "beignets" on Google, and the first result is Cafe du Monde. Cafe du Monde IS the beignet. The pastries come in bags of three ($3.99), so I had no choice but to splurge. They were light and sweet, utterly irresistible. When I first peeked into the bag o' beignets, I saw a lot of powdered sugar, but there wasn't much on the doughnuts. Then I remembered something I saw on the Food Network: This required a good shake. I gripped the bag shut and thoroughly rattled it like a gourd, covering the warm beignets in sugar. Delightful. I just HAD to eat them all. 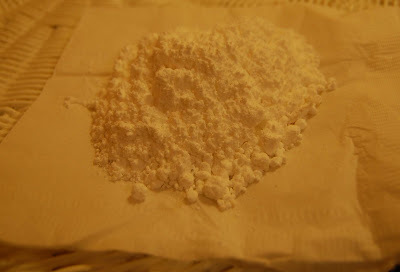 Considering all the sugar on my beignets, however, it's amazing how much was left over, below (I assure you, this is not cocaine). A couple of days after returning home from New Orleans, I still have the bag of sugar. Don't ask what I'm going to do with it. The cafe au lait drink ($3.50) was OK. But I can't say it's much better than a latte from Dunkin' Donuts. One of the simplest of New Orleans traditions is the po' boy, a contraction of "poor boy." It's a sub sandwich made of French bread or a baguette and stuffed with meat. The most popular stuffing is fried shrimp. I went for the catfish po' boy ($8.99), only because I had eaten a shrimp po' boy once before, albeit in Philadelphia - the land of cheese steaks - instead of New Orleans. Plus, I had never eaten catfish. The sandwich was simply superb. "Simply," I say, because it was dressed only with lettuce, tomatoes and pickles. Often, po' boys come with a special sauce, and I was disappointed not to see any sort of Creole mustard or mayonnaise on mine. But the meat was so moist that it wasn't necessary. It had a clean, non-fishy flavor. I got an expensive cappuccino ($3.99) to top my delicious meal and to warm myself in the nippy (60-degree) outdoor dining area. I stayed for about an hour, listening to Steamboat Willie blowing his horn and singing jazz with his bassist and banjo player. One should not be shy when going to Mother's Restaurant. You have to compete for a spot in line, then make sure you don't accidentally relinquish it once you get one. I jumped into the line around 11 a.m. I jumped out for only a few seconds to grab a menu as I waited, and the lady behind me gave me a hard time when I tried to reclaim my old spot. I eventually did. Don't mess with a hungry journalist. While I waited in line, cooks came through the dining room with huge pots of food, yelling at customers to move out of the way as they transferred the grub from kitchen to serving line. When I actually got the food, it was not that hot. 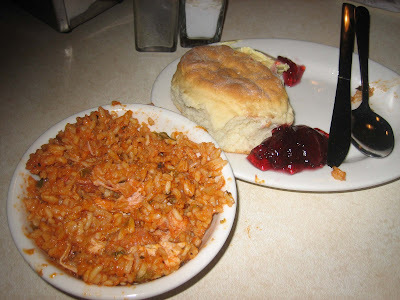 I ordered a much-ballyhooed homemade biscuit with grape jelly, just because I was between breakfast and lunch, and a small bowl of the vaunted jambalaya ($7.25), just because it's another New Orleans favorite of mine. Sort of a weird combo, though. Mother's cooks food by the bulk. The eatery caters local events and to the tourists always choking it. Most of the tourists on the day I visited were also from Florida, so I fit in. The food was OK. The jambalaya was full of flavor, but only warm, not hot, and the spices were sort of dull. The biscuit (85 cents) was a biscuit (with jelly). My Hurricane Katrina tour guide recommended Mother's, so I thought I should give it a shot. I'm glad I did, but I probably will go somewhere else when I return to NOLA someday. 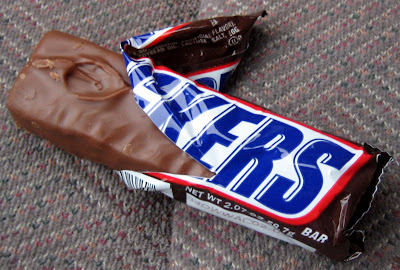 I'm a sucker for a cheap meal, so when a man offered me a Snickers bar for only a buck, I couldn't resist. The atmosphere was nice: Duncan Plaza, just outside City Hall, where 250 homeless people had set up camp, which then was being torn down by city workers. Dump trucks revved, pigeons cooed, and morning doves fluttered - an urban orchestra of sorts. 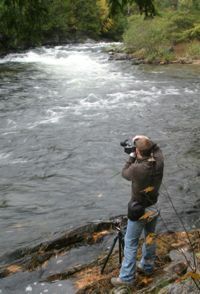 I was hungry and busy taking photos, so I didn't see myself finding time to sit down for a meal until later. I bought the candy bar for $1. The man (I couldn't tell whether he was homeless or just desperate) said he needed the money for the bus ride home. He just had been turned down by a police officer, and he didn't pressure me, so I helped him - and got a cheap, wholesome meal out of it to boot. There were still a lot of foods I hadn't eaten by Friday evening, when I had my last regular meal of my New Orleans stay. So I opted for the "Taste of New Orleans" platter at Cajun Cabin, a restaurant on Bourbon Street that includes a great wooden interior with faux swamp trees, complete with Spanish moss hanging down. Each night, a live Cajun band plays on the tiny stage in the shotgun-style building, hence its name. The band was loud. The band leader was cocky and somewhat annoying. But they made good music, so I let it slide. I had never tried authentic red beans and rice until this little cupful of it (above, cup on right). I don't know what more to say other than it tasted great and very unhealthy. I got a chunk of unexpected fat, so that was unpleasant. Shrimp creole was a first for me, too (above, cup on left). 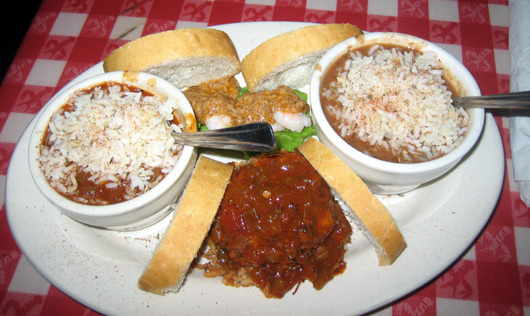 It's a traditional Louisiana dish that gives off a little more spicy hotness than the other food I had in New Orleans. It's made with a sort of hot sauce, with shrimp, sausage and chicken, making it sort of a mix of jambalaya and gumbo. This was the most flavorful dish I had. I'll miss shrimp creole the most. Jambalaya, on the other hand, I had eaten earlier in the day (above, mound between two pieces of bread). But it came with the plate, so I had no choice. And the rice was severely undercooked, making it sub-par. The other flavors were good: I just couldn't get past the firm rice. But I couldn't waste it, so I ate the whole thing. The remoulade smothering the four pieces of cold shrimp possibly had cayenne pepper and horseradish (above, on bed of lettuce). I'm never good at pinpointing ingredients, but that's what it tasted like. I topped the four pieces of toast with the shrimp. A very good pairing. The service was pleasant and fast at the Cajun Cabin. My last day, Saturday, was the first chance I had for a full breakfast in New Orleans. 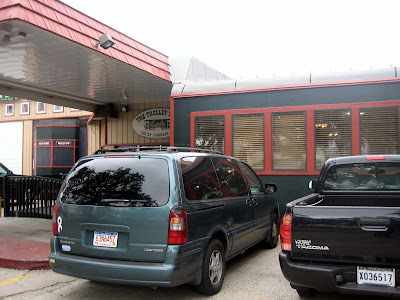 The Trolley Stop Cafe is another New Orleans classic that draws tourists, but mostly locals. When I was there, the crowd was a mix of young professionals, police officers, middle-age men and young families. Good vibes, for breakfast. "Sometimes you just want some good stick-to-your-innards meat and potatoes for breakfast," he said. "That isn't it." But he admitted that he had ordered the pancakes once, only because he had tried everything on the menu and wanted something new. He said he struggled to finish it. 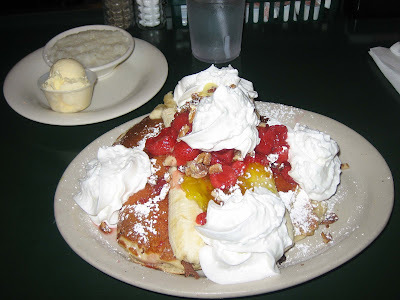 When I got my plateful of two 10-inch pancakes, they were stuffed with banana cream pudding and topped with a large banana sliced lengthwise in half, pineapple sauce, strawberry syrup, sliced strawberries, walnuts, powdered sugar and four dollops of whipped cream. I estimate that I woofed down all but about an eighth of it. When the waitress returned, she was surprised by how much I managed to consume. "You did much better than most people usually do," she said. "Most people only finish half of it. Plus you had the grits. That's not bad." I told her I had a long journey home ahead of me and needed my energy. Between its music, its people, its food, I left New Orleans with a sweet taste in my mind and in my mouth. The Trolley Stop Cafe is an old train station renovated into a restaurant, where the conversation is to savor and the food is very sweet. Hey Andrew, it's Judy from the BDN. I had a chance to read your posts over the holiday week while waiting for the press to finish its run late at night. 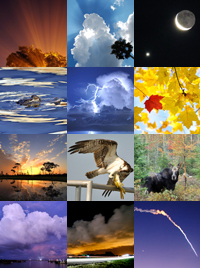 Your stories gave me some real meat to chew, and I appreciate that. It's hard to know what New Orleans is really like right now, even if you're reading copy about it regularly like I am. I did read a great piece from an assignment editor of some sort who works for AP and lives in New Orleans. He or she explained how devastated the region is, and your piece did so in a new sort of detail. I'll be checking your site regularly, but remind me to do so when I'm not hungry, because I wished I could pull the gumbo right off the computer screen. Judy! I'm glad you had time to browse around my site. I tell ya, though, I miss you all there at the BDN. Especially the times at Dysarts. Also, a comment from you makes me really hungry, too. When I think Judy, I think three-cheese mac and cheese. Now that you're in Florida we are a few steps closer to my mac-and-cheese truly becoming "world famous."